Feeling Beautiful Inside and Out certainly doesn't have to cost an arm and a leg! For every pricey Department Store Brand, I'll bet that I can find you an equivalent product at your local drugstore! As a blogger I get to test a lot of wonderful products, but my skin tends to need a break, and when I'm not testing anything specific, the brand I usually go back to is Neutrogena! I started with Neutrogena in my teens, their iconic Glycerin Bar was the only thing that would work for my skin for a long time, and it's still the one I turn to when my skin gets angry from playing with so many different products per week. For me beauty starts on the inside, being emotionally, mentally and spiritually in balance gives you an inner glow that you can't help but radiate outward! Getting the outer you to reflect that beauty inside doesn't have to be complicated and can definitely be super affordable. I am now days away from my birthday (April 4th), and as you know after me spending a year in the hospital, 3 different hospitals in fact, this year I want to go all out for my big day, I want to have fun and just be happy that day, so when a package arrived at my door with Neutrogena's essentials for Spring I couldn't have been happier! I considered it an 'Easter Basket' Blessing for us grown ups! Ƹ̵̡Ӝ̵̨̄Ʒ - The Oil-Free Cleansing Wipes in Pink Grapefruit is geared to those with Acne Prone skin, the premoistened wipes help cleanse the skin of pore-clogging impurities leaving your skin clean and with no greasy residue. I personally always carry makeup remover in my cosmetics bag, and I never thought of remover wipes formulated for acne prone skin until I tried these! Ƹ̵̡Ӝ̵̨̄Ʒ - Neutrogena® Ultra Sheer® Dry-Touch Sunscreen SPF 45 - This is a light weight formula that provides heavy protection from UVA/UVB rays. It provides 80 minutes of water-resistant coverage, and it's non-comedogenic so it won't clog your pores and it's PABA-free! Please protect your skin from the sun butterflies! I lost my Aunt/Godmother to Skin Cancer! Ƹ̵̡Ӝ̵̨̄Ʒ - Shine Control Line - The Shine Control Primer is step one for a shine free face all day, you then follow it with the Shine Control Liquid Makeup and then lastly the Shine Control Powder is a quick 3 step system to help keep you shine free and beautiful inside out all day! Oily girls or just those with an oily T-Zone will love this system! Ƹ̵̡Ӝ̵̨̄Ʒ - Healthy Lengths Mascara - Exclusive Vitamin E and Olive Oil formula will nourish and strengthen your lashes so they stay strong day after day, it lengthens and I can tell you I have experienced absolutely NO clumps, flaking or smuding, it replaced a different very popular 'available in drugstores brand' that I was previously using. I really do love this mascara! I am a long time Neutrogena user, it's what I started with to care for my skin as a teen, and it's what I still use now to regulate my skin between product evaluations! I think I've probably used every product in their line at one time or another, but I will admit the Eye Shadow, Mascara and Primer were new to me, and I greatly enjoyed the chance to try them out! All of them are a re-buy, but the Mascara really stands out, it doesn't clump, it gets really good distribution and I haven't had to double dip and it really applies easily and smoothly. If I get another bundle of love from Neutrogena, I hope it contains their Body Oil (light sesame formula) as that has been my favorite Neutrogena product for what seems like my whole lifetime as my mom introduced me to it first many years ago and I still use it just out the shower with my skin still slightly damp! This Body Oil was a life changer for me, I love the way it leaves my skin feeling and I use it for all four seasons! I feel ready to face Spring with a fresh face and beauty from the inside out! I will definitely be using these again on my birthday! Happy April Fools Day Butterflies! What is your Neutrogena Beauty Favorite? FTC Disclosure: I am participating in a compensated campaign with Neutrogena via Latina Bloggers Connect, products were sent to Ascending Butterfly free of charge for editorial consideration, however all opinions are 100% my own. That Body Oil really did change my skin! 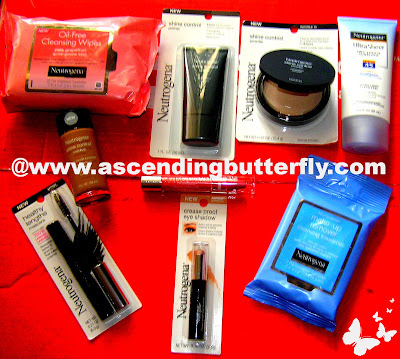 Neutrogena 's sesame oil is by far my favorite!Good to know they have new items,I'm going to check them out!! @Big Happy Buddha - Rainbath and the Body Oil are my two favorites that I just have to keep in stock before I even run out!